A sophisticated toy has just been unveiled and it’s just like the X-34 craft used in star Wars: A new Hope. It has two rider seats, three gears, including reverse and is valued at $500. Luke Skywalker’s Landspeeder as it is called has been made to look like the X-34 aircraft from the popular Star Wars. The mini vehicle has a dashboard with lights and interesting features just in front of the two riders. The dashboard has five buttons that make different audio sounds from Star Wars: A New Hope. The Landspeeder’s dashboard has a gear shift which switches between three gears – 5 miles per hour forward, 2 miles per hour forward and a reverse gear. On reverse mode, the Landspeeder moves at a speed of 2 miles per minute. So for the two forward gears, the toy can move at approximately 134 meters per minute (5 miles per hour) and 53 meters per minute (2 miles per hour). The reverse gear also produces a speed of 53 meters per minute. It comes with a rechargeable battery of 12 volts. The product also comes with a charger. It’s true some parents won’t want to miss out on the experience. There is no problem with that but makers of the toy have made it known the maximum weight you can put on it is 130 pounds. 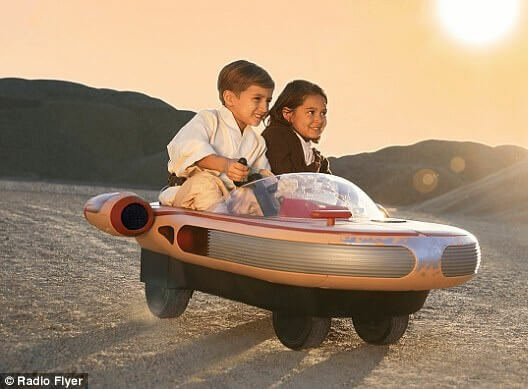 The Star Wars Landspeeder is made for children; 4+ years and a customer is only allowed to purchase just one of it. The Luke Skywalker’s Landspeeder does not hover. It is made with tyres and requires assembly when purchased. The toy is available for preorder; $499.99 at toysrus.com and it can only be purchased by United States residents. The toy company says it will begin shipping the item on the 5th of September, 2017.